on’t you just get fed up with spending hours and hours trawling through the numbers, records and accounts each week for your investment club. Do you find the process tedious, or difficult? By the time you finish reading this article, you will know how to change all this and make the whole thing a smooth, enjoyable process. Are you the person who’s been roped into doing the accounts for your investment club, and are finding it a difficult and time consuming job?....... I was. I have been running the accounts for our investment club for a number of years, and at first I found it very frustrating trying to manage the different factors that cropped up during the normal day to day events in our investment club, such as managing different member’s monthly and one off contributions, accounting for joiners and leavers and distributing dividend income. Like you, I didn’t want to be spending hours doing the administration for the club, when the time could be better spent doing what we started the investment club for – investing in stocks and shares. I then began looking for a solution and my research, both on the web and speaking with other investment clubs, led me to discover that the popular Unit Valuation System of accounting addresses all of these issues. The Unit Valuation System is the recommended method of accounting for investment clubs by Proshare and the National Association of Investment Clubs (NAIC), as well as being used by the majority of the clubs in the country. The main benefit of using the Unit Valuation System is flexibility to manage the varying needs of an investment club make such as varying subscriptions or withdrawals at any point in time which is not easily done if the club is set up on an equal share basis. The problem I found, however, is that while there are many websites that talk about it, and even give you working examples, I still could not find a simple, understandable guide to running the accounts for a real club using this system, nor any software to help me. I decided, therefore, to develop my own process and software bringing together all my research and, since 1998, I have been using it successfully within our own investment club. When I started showing it to other clubs there was a lot of interest, which began to pick up….to such an extent that I began to write the process down in an easy to follow way so that anyone running the accounts for an investment club could pick it up quickly and be running their own club's accounts in no time at all. Imagine being able to have a system at your fingertips that was so straightforward and easy that the job was done in an instant, freeing up your time for more important things. How much nicer would it be to have an easy step-by-step process that works itself? To be able to get the job done and to be able to present a perfect, up to date report to your fellow investors in no time at all. You’ll be able to relax and enjoy your free time in the confidence of knowing you have a job well done. ‘Easy Accounting For Investment Clubs’ does just that. 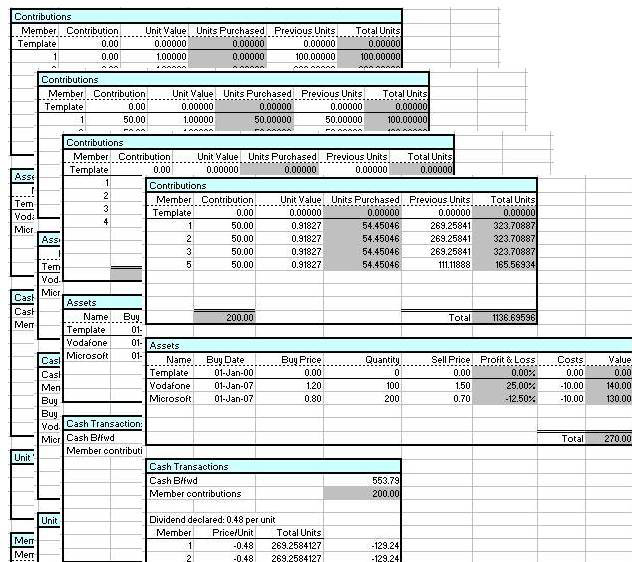 It combines my own research and practical experience in running the accounts for an investment club into a simple step by step process that allows you to run each aspect of the accounts for your investment club using the Unit Valuation System, from start to finish, in a quick and hassle-free way. Simplify your life now! If members want to leave, or the club expands - no problem! 8) Opening a new club? 9) Managing an existing club? The 'Easy Accounting for Investment Clubs' package comes in two parts. The first part is a 33 page illustrated guide giving you a simple, step by step process for each aspect of running the accounts of an investment club using the Unit Valuation Method, from opening up of a new club all the way through to closing a club, including basic tax information. As mentioned earlier, the Unit Valuation System is the recommended method of accounting for investment clubs and is a proven, popular, well used system, and this guide makes using it really easy. The second part of the package is the accompanying software. This allows you to set up or transfer your existing club account information onto this straightforward, all-in-one spreadsheet to manage the accounts for your investment club. The illustrated guide works through specific examples from the software, of each stage of the process, allowing you to pick and choose what you want to do with your club accounts. It therefore allows to manage each stage of your accounting with ease and confidence, and give you a simple way to keep the others in your club updated and informed as to their shares and the progress of the club's investments. ......Investment Club Accounting has never been easier! If you consider that the average accountant charges around $100 per hour for their services, then every hour you are spending managing the accounts for your investment club is effectively costing you this. By following the process and using the software provided in 'Easy Accounting for Investment Clubs' even if you saved a minimum of 1 hr per week, that would be saving you over $5,200 a year in what this time is really costing you! Imagine how much less work this will make for you, and how much time and money this will save you. And of course, that is just each year...over a 5 year period as your club accountant that would add up to a grand total of $26,000! Now that you have read this article, I am sure you can see how 'Easy Accounting for Investment Clubs' will really make your life easier. 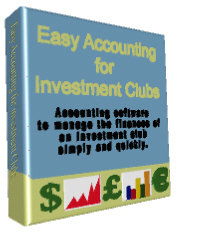 The 'Easy Accounting for Investment Clubs' software is build in an Excel Spreadsheet format, and the accompanying 26 page illustrated guide is in a pdf format for easy reading and printing. You will need to have Microsoft Excel or a compatible spreadsheet program, and Adobe Reader. The software is yours to use for the life of the club. There is no annual subscription, just a one off payment. On receipt of payment, the software will be immediately downloadable from our website. "Your satisfaction is guaranteed with our 100%, no-questions-asked, iron-clad money-back guarantee. If you aren't absolutely thrilled with the software package, just contact us within 8 weeks and we'll refund 100% of your purchase price. No questions asked." Test the method for yourself... Try as many of the scenarios as you like. Once you've started using the software and guide with your investment club accounting, I'm confident you'll NEVER want to send them back! So you have nothing to lose when you give it a try today. Within minutes you will get download instructions, and you can start enjoying the benefits of ‘Easy Accounting for Investment Clubs’ right now. You don't have to decide now if this accounting package is for you. Just get it and try it out. If it doesn't do everything I say and more, if you don't save time, or your life isn't made easier, or if your hours of frustration aren't removed, or if you don't absolutely love it, just let me know and I'll give you every penny of your money back! So you have nothing to lose and everything to gain." P.S. Remember, if after trying it out, you don't find your job running the accounts for your investment club made unbelievably easier, contact me for your money back!